I loved that i could hear the waves crashing from my window. Every employee i encountered was very pleasant and sincere. This quiet resort is a comfy 3 star contrast to the upscale resort next door and upscale shops and restaurants that are just a short, lovely walk along the beach. The rooms are comfortable and clean, the staff was very friendly, the grounds are spacious and pretty, the extensive beach is gorgeous, and the public bus nearby can take you to bustling city and Harbor in about 20 minutes. There are a lot of amenities on site, and the location is excellent. This resort claims to be the true Hawaiian resort, and if amenity shacks on the grounds with palm frond roofs are their criteria, this is true. A great value. Close to the beach, shops, restaurants, etc. Also had a lot of rental options such as chairs, surfboards, sup boards, coolers, snorkel gear, etc. It was absolutely amazing! The room was a bit dated though. Other than that, perfection. Loved how close the beach was everything was really nice but the staff at the tiki grill were always rude. Very good hotel for the money.... Steps away from the beach and super nice staff.... Definitely would stay there again! Rode out hurricane lane, the staff and facilities made it as pleasurable and seemless experience as can be. Information and communication of the event was forthcoming and correct. The hotel staff were empathetic, accommadating and helpful to guests all around. Mahalo, and well be back soon. The parking spaces in the ramp were extremely narrow and frequently filled up. They were difficult to navigate and at $12 per day, a bad deal. A very pleasant and authentic Maui hotel. Great experience. Great location. Right on the beach. Ask the valet boys for cheap food recommendations versus paying more for meals. They know all the good places to eat. First time in Maui, and loved it! KBH had a lot to do with it, great experience and will definitely come back here. The food at the hotel was the only that we didn’t love, but overall great experience. Thank you for everything. Kaanapali Beach Hotel places you next to Kaanapali Beach and within a 10-minute stroll of other popular attractions like Whalers Village. This 3-star hotel has 432 guestrooms and offers conveniences like a restaurant, an outdoor pool, and free in-room WiFi. You can enjoy a drink at the bar/lounge or visit the onsite restaurant for a bite to eat. You can sip a beverage at the coffee shop/café. For your convenience, a buffet breakfast is served for a fee each morning from 6:30 AM to 11:00 AM. 32-inch a TV are available for entertainment, and guests can stay connected with free WiFi. The bathroom offers hair dryers and free toiletries. Other standard amenities include a coffee maker, a ceiling fan, and a phone. Kaanapali Beach Hotel features an outdoor pool, free WiFi in public areas, and a business center. Valet parking is available for USD 18 per night. The front desk has multilingual staff on hand 24/7 to help with tours or tickets, securing valuables, and luggage storage. Other amenities at this beach hotel include a microwave in a common area, a computer station, and laundry facilities. Thank you for sharing your comments from your recent visit to our hotel. We apologize for the disappointment you experienced. Guest feedback is something that we value and take very seriously as this helps us continue to improve and better serve the needs of our guests. We hope that you will give us another opportunity to serve you in the future. Mahalo for choosing Kā‘anapali Beach Hotel. We strive to make our guests happy and appreciate your kind feedback. We look forward to welcoming you back soon! Mahalo for taking the time to share your comments. Our travel partners generally rate us as a 3-4 star resort; nonetheless all of us at Ka’anapali Beach Hotel strive to provide 5-star service and great value for our guests to complement our world-class location. We are delighted that you enjoyed your stay and look forward to welcoming you back again. Buffet breakfast is served daily from 6:30 AM to 11:00 AM for a fee. 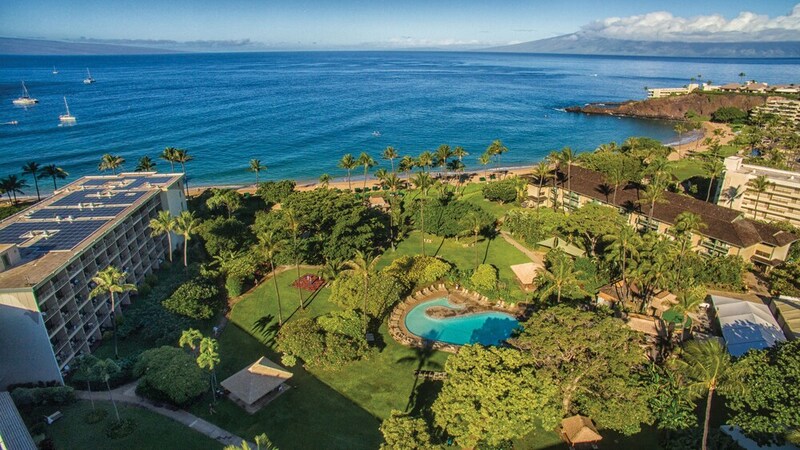 Recreation features at Kaanapali Beach Hotel include an outdoor pool. Guests celebrating their honeymoon or anniversary may receive (subject to availability) the following benefits: 1-category room upgrade for bookings in Garden View, Pool/Courtyard View, or Partial Ocean View accommodations; and a split of sparkling wine. Guests must notify the property either at time of booking or following booking that they are celebrating their honeymoon or anniversary. Marriage certificate may be required. Offer subject to availability. Offer is not valid with groups/conventions and may not be combined with other promotional offers. Other restrictions and blackout dates may apply.